McDowells Trail CrewThe Arizona Mountaineering Club’s Land Advocacy Committee works with land owners and land managers to maximize rock climbing opportunities through its advocacy and stewardship of rock climbing areas. The AMC worked with the City of Scottsdale to develop a Rock Climbing Plan and Climbing Management Plan for the rock climbing crags in the McDowell Sonoran Preserve. 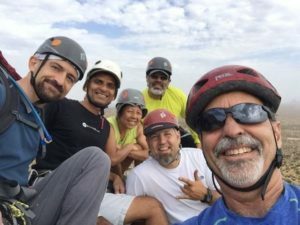 The partnership with the City of Scottsdale is a prime example of working with a local land owner and land manager on gaining access to rock climbing crags, building the trails to those crags, installing trail signage and then providing the long term stewardship of rock climbing in the McDowell Sonoran Preserve. Currently Erik Filsinger is the AMC’s Land Advocacy Chair. Because all of the guidebooks and most of the Internet sources of climbing routes existed prior to City ownership, the approval of the rock climbing plans, and the completion of new trail heads and trails, this information is not necessarily available anywhere else. The AMC has been involved in the potential land exchange and mine near Superior, Arizona since the news first broke in 2004. Currently other climbing groups are advocating specific points on the issue. The AMC’s Board of Directors adopted the following policy statement on behalf of the club.